When some people see the word “refurbished” placed in the title of a PC, their immediate reaction is to avoid the item like the plague, not knowing all the differences between a refurbished and new PC. People sometimes confuse “refurbished” or “repackaged” PCs with used ones. There’s a huge difference between the two. If you shuffle past something that’s refurbished, you’re missing out on a great deal. Buying refurbished material isn’t the same thing as getting something second-hand. Let’s examine the differences between a refurbished and new PC and open our minds to new, concise information about the refurbishing process. What Is A Refurbished PC? Anything that’s “refurbished” means that it’s been returned within a certain period of time by the customer to the distributor. The distributor repackages the product and sends it on its way to a special shelf where refurbished materials go. This is not to be confused with a “used” product!! Anything that’s described as “used” has been in the possession of the customer for a long time. Refurbished products often aren’t even opened and are returned because of an error in the transaction. Let’s say some guy clicks the order button twice when buying a 400 GB hard drive. He gets two of them at his house and returns one of them because he didn’t need it. That’s usually how the refurbishing process begins. The store has no choice but to sell it as a refurbished product since it was already ordered, therefore reducing the price of the product. The reduction could be a sum just shy of what it cost before or something more significant, depending on how many days this product has stayed in the hands of the customer. A store-refurbished PC is simply a unit that wasn’t sent back to the manufacturer for repackaging. It means that the store has reason to assume that the product isn’t damaged in any way. The store sells the product at a lower price with a short warranty usually lasting 30 to 90 days. A manufacturer-refurbished PC is one that was sent back to the manufacturer for quality control inspection before repackaging. In this case, the PC will be sold with a long warranty, if not a full one. Warranties could even exceed a year if the manufacturer refurbishes the product. This is the safest bet and gives you a significantly better deal than a new PC. So, Why Not Just Buy New? Well, you can buy a new PC. That’s the safest way to make sure that you’re getting your money’s worth on a product that hasn’t been shipped and handled a load of times. Also, you get the fullest warranty and support package you can get. But if you’re strapped for cash and want to save a bit of money, you can buy refurbished models. Just make sure that you get a manufacturer-refurbished product. Store refurbishing is more of a gamble. Also, new PCs still come in the pretty box they originally shipped out of the manufacturer in. Refurbished models rarely give you this privilege. So, if you want to buy a refurbished PC, remember that while store-refurbished PCs might cost less sometimes, they’re more of a gamble. 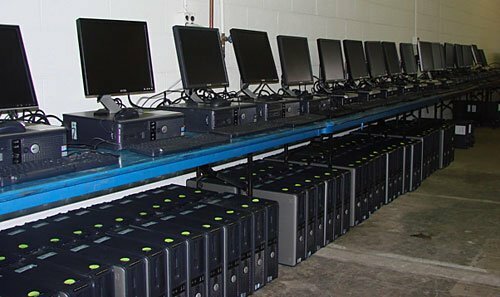 Manufacturer-refurbished PCs give you the guarantee that the product has been inspected by an expert in its manufacturing process. New PCs still offer you more advantages by giving you a device that hasn’t been shipped back and forth (hard drives are delicate). Another plus is that you will always get the best warranty. The decision between a refurbished and new PC is ultimately yours. Refurbished PCs are often just as good as new ones. The risk is minimal. Comment below if you’d like to speak your mind about this subject! Great article as always, Miguel. I’m a Professional Engineer in Canada, with 30+ years of microcomputer experience. I was on the IBM design team for the original PC and follow-on PS/2 (which became the ‘real PC’). I’m not trying to impress you, just to say that I do know the PC from below the silicon all the way up, both the science and the practical. Your articles are always right on the money, and I will begin referring my clients and followers to your blog, and others on MTe. Everything you said is quite correct, and I would add a couple of experiences I’ve had. I’ve worked in PC factories and also with mega-retailers (Best Buy). 1. Some of what you call ‘store-refurbished’, the never-used is often sold as ‘Open Box’. As long as full warranty and return rights apply, this is completely safe. You usually save 5-10% at no risk. 2. True ‘store-refurbished’, i.e. cleaned, repaired, and tested in-store can be your best bet, assuming the store has a good reputation for repair work. Often you’ll be able to find out what was done, and why. 3. The quality of factory-refurbished depends very much on the company. At Best Buy, most of my experience was with HP. HP is a cautionary tale, and I’d say it’s no surprise that their PC division is in such trouble. I often found that they would run a quick test and put it right back in the box and sell to another store. I also found that a lot of their parts for refurbish work were faulty. I suspect that they came from defective computers without sufficient component test. I’m not suggesting HP is alone in these practices, only that recently they seem to be the worst. The lesson is, if you get any whiff of problems with a refurbished PC in the first month, return it immediately and try something else. 4. Never assume that the contents are the same as the box. Refurbs will often go into whateve box is handy. For most manufacturers, their boxes are all the same size. 5. Take a careful look at the date of original manufacture. It’s usually on the label, or check the serial number at the manufacturers website. If it’s more than 12 months old, you should worry about the level of technology in it, especially the CPU. You should also think about the availability of parts. If you have it for another year or two and it fails, you may not be able to replace the defective component – esp. motherboards and power supplies. For laptops, always remove the battery and check its date. Li-ion batteries have a limited shelf life, about 3 years whether it’s been used or not. If a refurb has been kicking around a while, you may be buying a battery that is 1/2 to 2/3 dead out of the box. Could be even worse if it’s been stored in a hot warehouse. 6. Apple computers are a bit different, because they warrant the entire system, including OS and battery, and start the warranty clock from the date of first sale. When buying a refurbished Apple, insist that the store has the warranty date reset by Apple, and make sure when you register the product at Apple’s website (which you should do immediately). Some stores won’t want to do it, because it’s extra work and hassle for them. Just tell them that’s a deal-breaker. Despite all these warnings, I agree with Miguel that refurbs can be a great buy. All electronics suffer from early life failures; after the first six months you’ve got years before things wear out. So if done properly, someone else has suffered the first failure for you, and they’re going to give you a big discount as well. I always get at least 25%; it’s negotiable. Just be very careful how you pick the one you take home. Unlike new product, every refurb is different, and a little homework and investigation will let you pick the diamond from the lumps of coal.